We help your business grow – which means helping you get more customers, make more money or gain more market share. We help you figure out what to do. We often start client relationships by looking at where your business is on The Growth Curve. This simple ‘curve’ models the 3 Phases of growth and shows how businesses evolve from ‘start-up’ through success. It also explains why many are blindsided by change and can’t adapt. For us, The Growth Curve’s power is its simplicity and accuracy. It simply says that businesses grow by: discovering (figuring out) a pattern of success (Phase 1), duplicating the pattern of success (Phase 2), and successfully modifying and re-thinking their business when the pattern that got them successful no longer works as well as it did (Phase 3). The Growth Curve explains how companies like Apple struggled and then exploded with success, why the radio and record businesses are hurting and why IBM was able to re-invent itself when many had written it off for dead. It shows where India is growing so fast (Phase 1), where cable operators are making so much money (Phase 2) and where American auto companies are stuck (Phase 3). It explains why Microsoft is re-thinking the strategy that made it successful for 20 years (Phase 3). 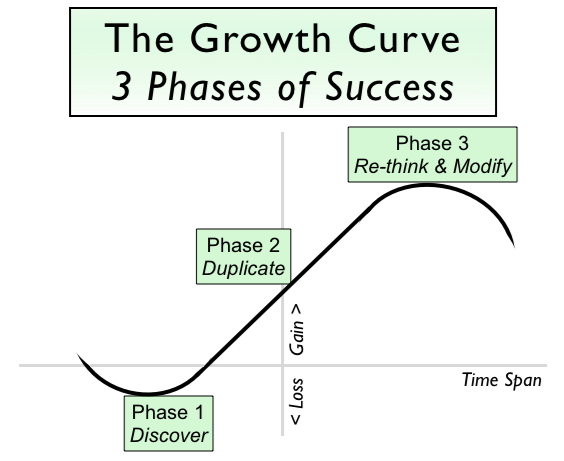 In our experience, many businesses seek our services at Phase 1 on The Growth Curve (trying to figure out or discover their pattern of success). Many online businesses are here. And, many hire us when they are at Phase 3 (when things often aren’t working as well as they used to or they anticipate major disruption and want to work on a new strategy). Many ‘well-established’ companies are here.